George Washington's financial documents are an excellent resource for economic history of the United States. While they are filled with currency types, currency exchanges, and commodity valuation, these documents also provide valuable insight into Colonial America as a whole. A number of historical topics can be studied with these financial documents because they a rich with information about the communities and show how people interacted with one another. Below are a number of word clouds demonstrating a small percentage of what can be studied and how simple visualizations can help to analyze this content. Word clouds, also referred to as tag clouds, are a visual representation of word frequency in a specified text. The more frequent a word is used, the larger and more prominent it is within the word cloud. By using these clouds, basic text analysis can be done and important themes or content can be communicated. They are great to quickly identify types of materials or various items being purchased, and frequent/popular individuals Washington is interacting with. However, it is important to note that they can not determine how much a particular item was purchased. For example a single transaction could refer to the purchase of 50 pairs of shoes. Since word clouds measure word frequency and not quantitiy, the word shoe is only registered once. 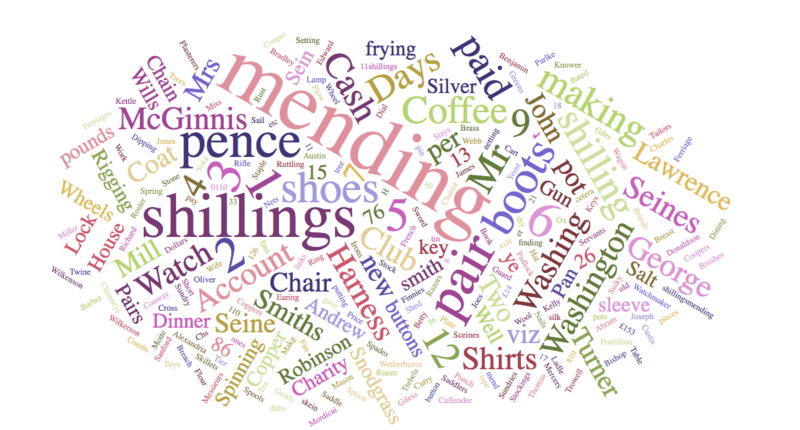 However, other visualization tools could help to provide a visual representation of how many shoes Washington purchased. 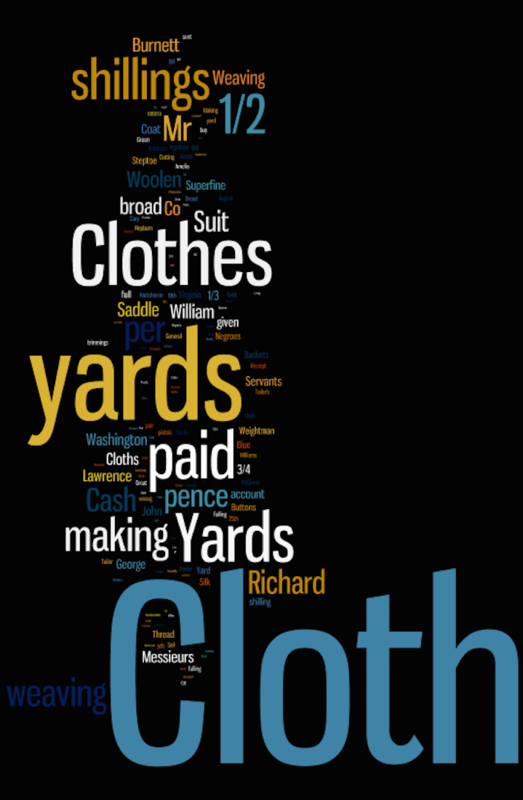 The following word clouds focus on four themes: cloth, doctor & medicine, mending, and subscriptions. A search was performed on each of these keywords and the information exported using the XLS feature. 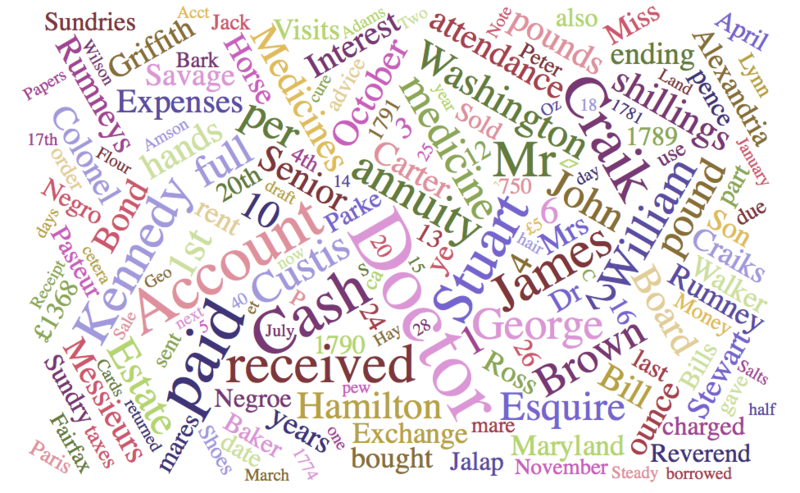 The related transactions were then pasted into a word cloud generator to produce these visualizations. 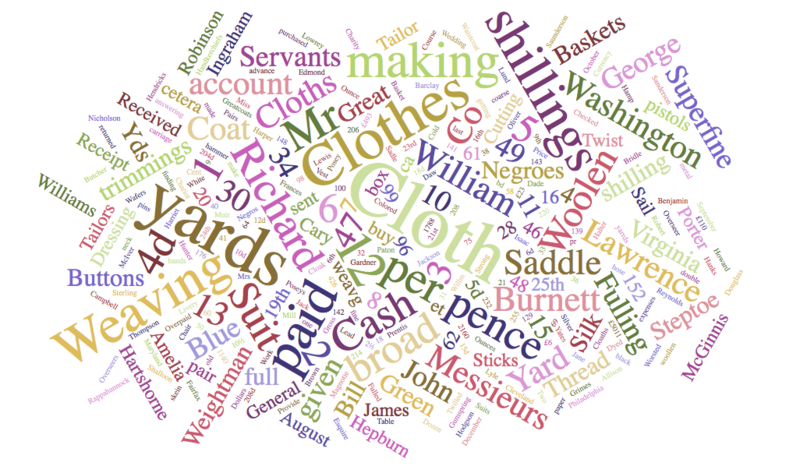 One of the major points seen when looking at the word clouds regarding cloth are the various types of cloth found within Washington's ledgers. There is broad cloth, green cloth, blue cloth, superfine cloth, saddle cloth, and woolen cloth to name a few. Additionally, the cloth was often woven (as can be seen by the word weaving) or taken to a tailor. Furthermore, cloth was purchased for servants' and slaves' clothing, for or from specifc individuals like Richard Burnett, measure by the yard, and sometimes bought in conjunction with other materials like silk. Two separate searches on doctor and then medicine were performed in order to obtain the necessary information for these word cloud visualizations. The most prominent aspect of these transactions focus on doctors who Washington used. James Craik, William Savage, William Brown, and William Rumney are some of the more frequent doctors mentioned within the ledgers. Washington paid them for visitng and treating the Custis children, as well as his servants and slaves. Less prominent are medicinal solutions and tonics such as jalap, hartshorn shavings, and ethiops minerals. While not seen within these visualizations, other medical terms to be searched include nurse and sickness. 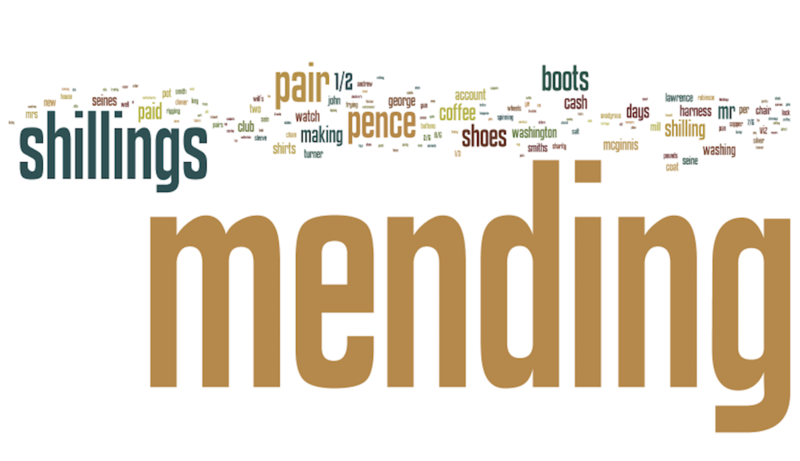 Washington paid for a variety of items to be fixed and often used the term mending to reference this action. Items that were frequently mended include boots, harnesses, riggings, watches, wheels, locks, saddles, and various types of clothing to name a few. Additionally Washington often paid Lawrence McGinnis to mend seines and Charles Turner for mending a number of items. The word subscription is commonly found within the ledgers. A subscription to a purse was often times referring to the a purse prize to be won at a horse race. Williamsburg and Alexandria are two locations where races were held and Washington subscribed to the purse prize. The use of subscription also referred to Washington's purchase of newpapers and books. For example, the words museum and magazine appear semi-prominently on the vizualizations. They refer to the American Museum, published by Matthew Carey in Philadelphia, Pennsylvania, and the Columbian Magazine, published by several individuals including Mattew Cary and William Spotwood. 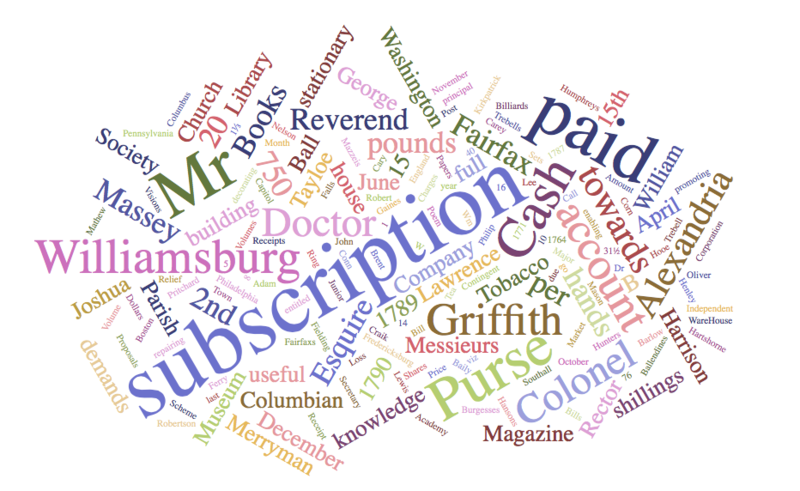 Lastly, the word subscription was used to refer to Washington giving money towards building funds. Examples include the building of a warehouse and the repairs of a church in Alexandria, Virginia.